Some of the world’s most fascinating creatures make their home in the ocean. Hawaiian green sea turtles are ancient creatures. They have been around since prehistoric times and are one of the five species of sea turtles native to Hawaii. Although its common name is green sea turtle, the Hawaiian name for this marine reptile, is honu. 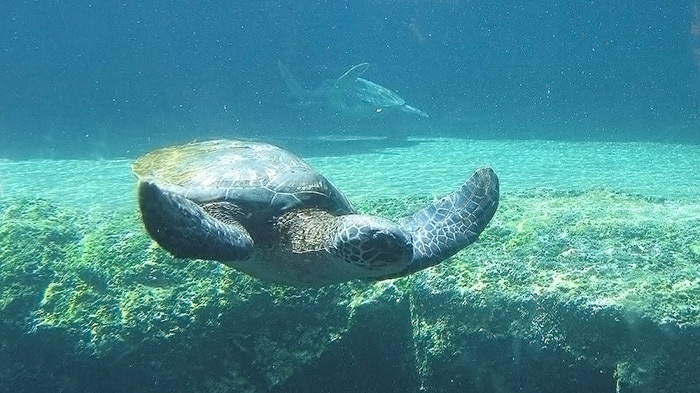 Honu make their habitat in temperate tropical waters all over the globe, including Hawaii. They are shy creatures and primarily live in protected inlets, shores and bays. Hawaiian honu make their nests in the northwestern Hawaiian Islands. The size of honu varies, but most adults range from 3 to 4 feet in length. They usually weigh anywhere from 200 to 450 pounds. The longest sea turtle ever recorded was 5 feet long and weighed an astounding 871 pounds. Honu can live up to 80 years. They begin mating around the ages of 25 to 30, continuing every two to three years in a cycle. Honu eat worms, crustaceans, insects and algae when young. When the honu grow beyond 10 inches or so in length, they become entirely herbivorous, eating only plants. If relaxed, honu may be able to stay under water for up to 5 hours before coming up for breath. The nesting habits of honu are instinctive and never change. When the female honu is ready to hatch, she waits in the shallows until sunset before swimming ashore. She then digs a 2-feet deep hole on the beach and lays nearly 100 eggs at a time. Once the nest is full, she buries it with sand and swims back into the water. The might occur up to 3 or 4 times per season for a female green sea turtle. Imagining that one honu produces 300 to 400 offspring each season makes it hard to believe honu are endangered. Unfortunately, rats, mongooses, crabs, and others prey upon these eggs long before the turtles are hatched. Those that survive must crawl through the sand and into the safety of the ocean as quickly as possible. According to legend, honu are “aumākua” or guardian spirits appearing in people’s visions and dreams. The Hawaiians regarded them as personal or family gods that could offer warnings and protection. Ancient Hawaiians also believed the shells of honu had healing and medicinal properties. Hawaiian green sea turtles are an endangered species. Their numbers are dwindling as they fall prey to many hazards and threats. People have long hunted these creatures for their meat as well as their shells. Others have made their shells into hair combs, sunglasses, dishes and jewelry. Honu face a multitude of other threats as well. Fishermen often snare them in fishnets and shrimp trawls. Some accidentally collide with jet skis or boat rudders. Also, they can die from ingesting plastic bags or from exposure to toxic wastes. If they too swim too far from the coast, they can be victims to sharks and orcas. There are biological threats for the honu as well. A virus-like disease called fibropapillomatosis, causes turmeric growths in the creatures. This can can wipe out sea turtle populations in less than two years. Although the exact origin and cause of the disease are unknown, 90% of honu may be fighting fibropapillomatosis. It develops with polyps on their soft flesh. Then it moves to the eyes, throat, ears and on their sides. And eventually it takes the turtle’s life by making basic movements increasingly difficult. The Hawaii Wildlife Fund has taken great measures to protect the lives of the dwindling number of green sea turtles. Many nature reserves have blocked off turtle nesting grounds from human access. Each visitor to the Hawaiian Islands can participate in the protecting these ancient creatures. You can do this by not leaving trash behind at the beach and being sure not to disturb or harass the honu. Perhaps with great care, these beautiful sea creatures can exist for many centuries to come.